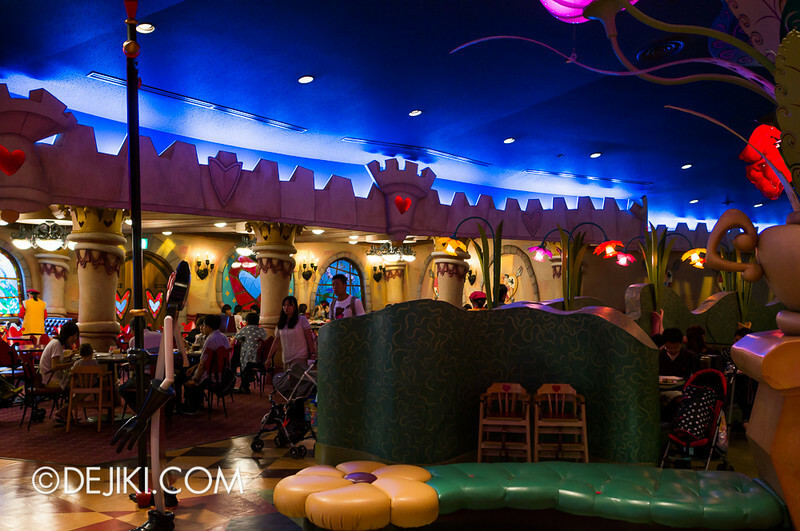 Our tour around Fantasyland continues! 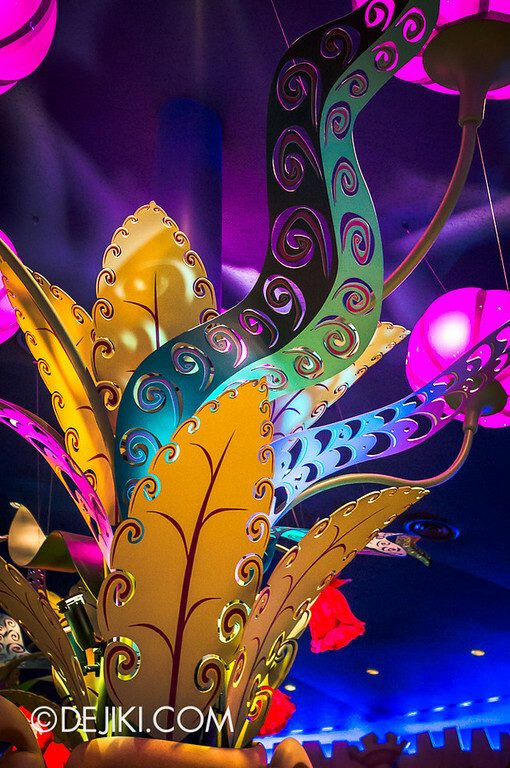 Walk inside the Queen of Hearts Banquet Hall and enjoy photos of this land of magic at night. 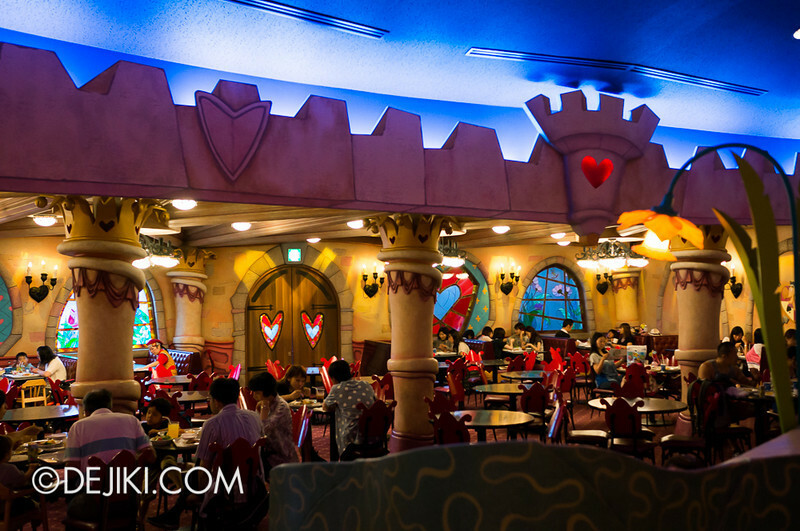 The Queen of Hearts Banquet Hall is one of highly praised restaurants in Tokyo Disneyland. 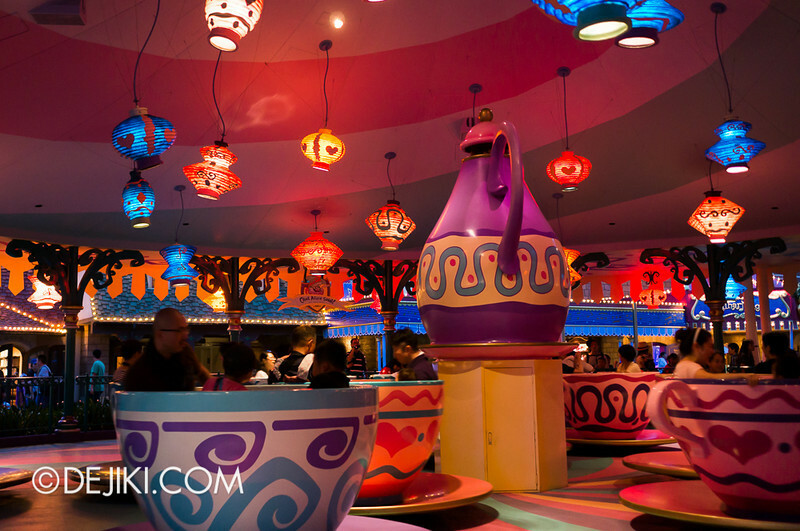 It offers a whimsical dining experience… in Wonderland. 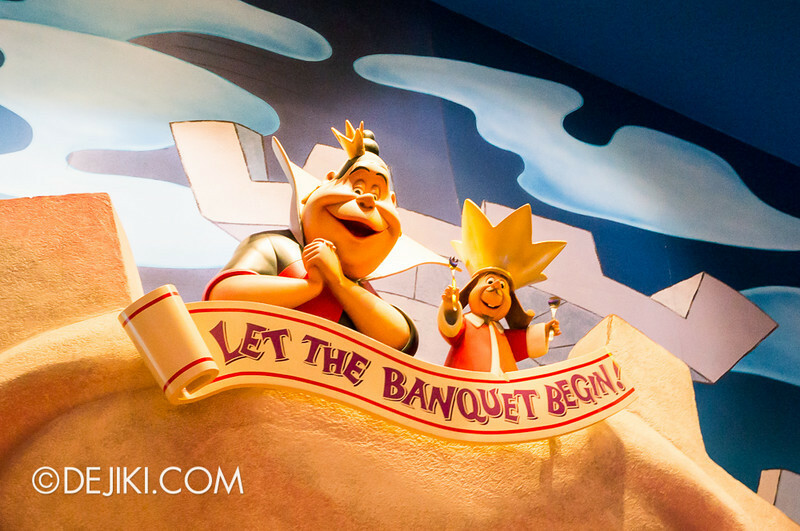 We wanted to dine at the Banquet Hall for lunch, but the line was really long; an estimated wait of 30-40 minutes according to the cast member. We went to Hungry Bear Restaurant at Westernland for Curry Rice instead. 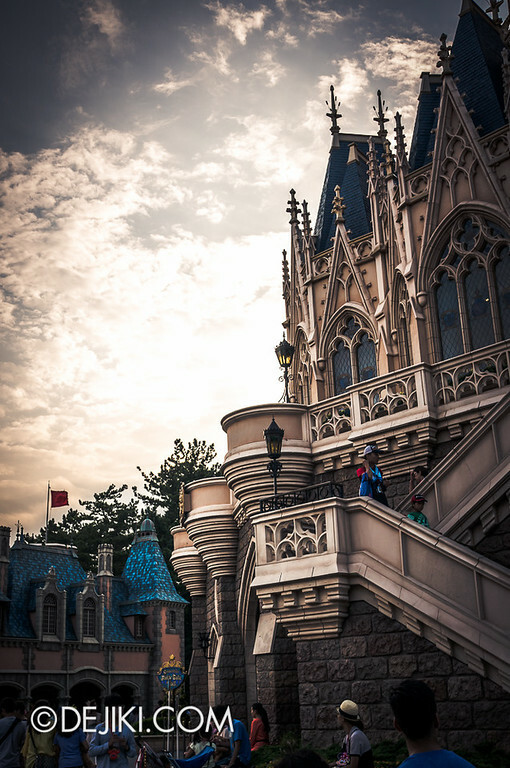 Anyway we returned to Fantasyland in the evening. There was no line outside, so we went straight in. The restaurant was fairly empty too. 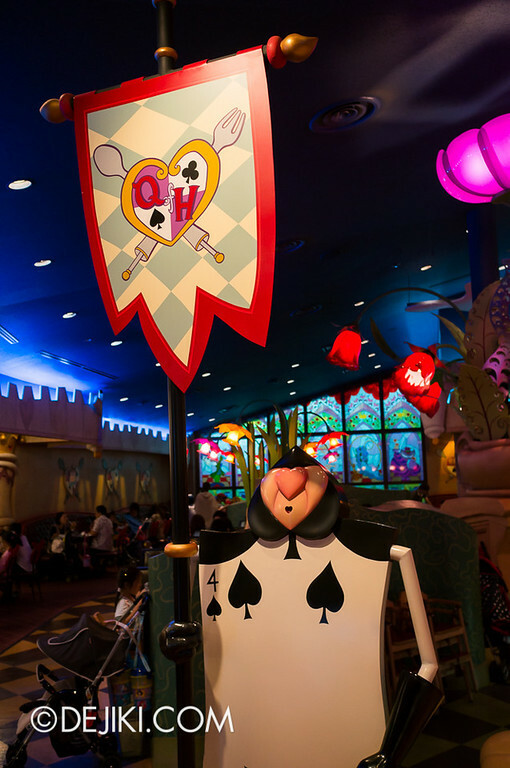 Thankfully the Queen of Hearts is always in a good mood here. 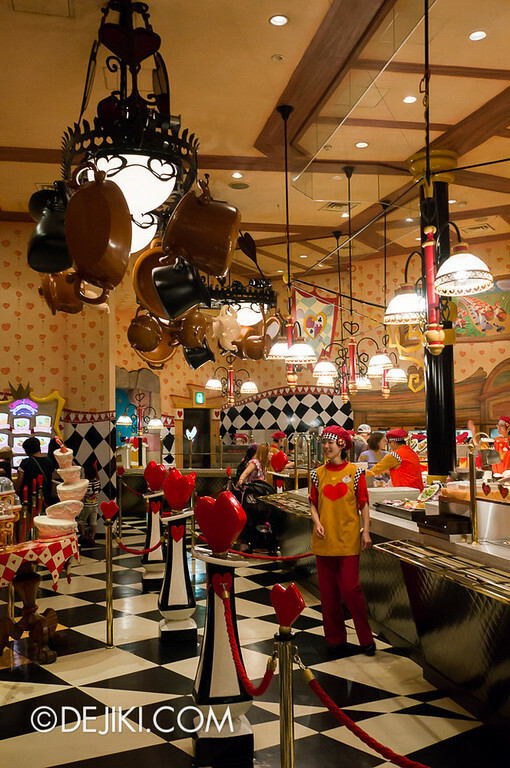 The Kitchen looks absolutely wacky. Walking around here feels like you’ve stepped into Wonderland. 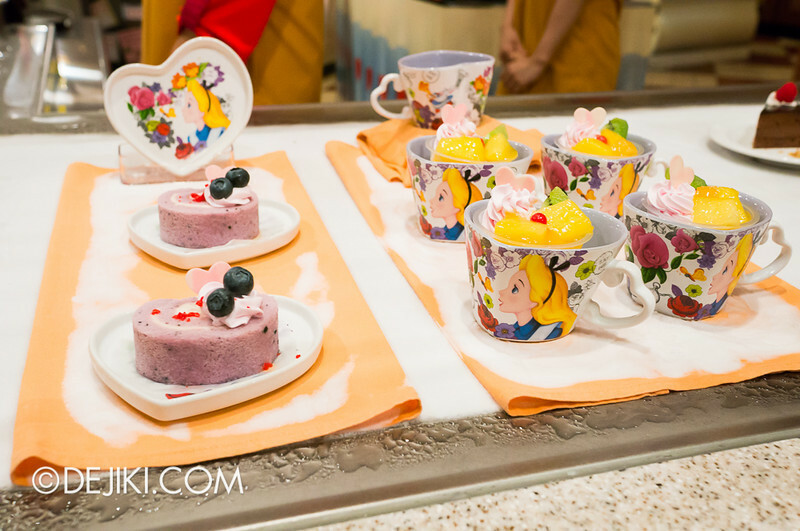 Desserts served in Souvenir cups and plates. My sister got the Creamy Custard Pudding (¥700, ~S$8.50), which comes with a tiny Alice cup. 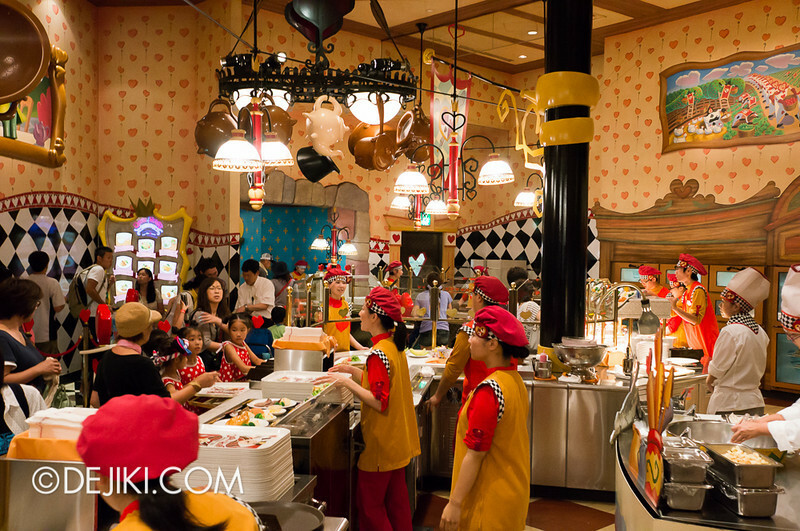 The nice thing about buying souvenir items in restaurants here is that the food is always separated somehow. The pudding is actually in another plastic cup. 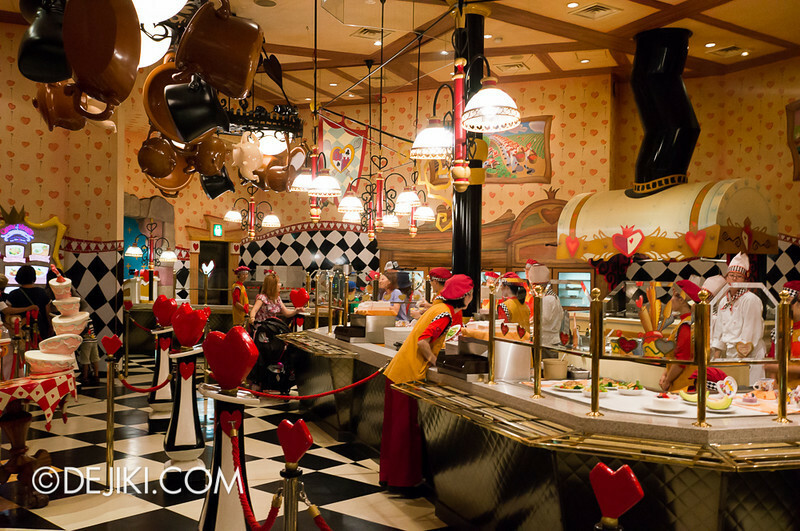 And oh, the cast members will offer a bag and bubble wrap at the cashier. You don’t even have to ask! Suddenly a lot of people turned up at the restaurant. Thank goodness we were minutes ahead. 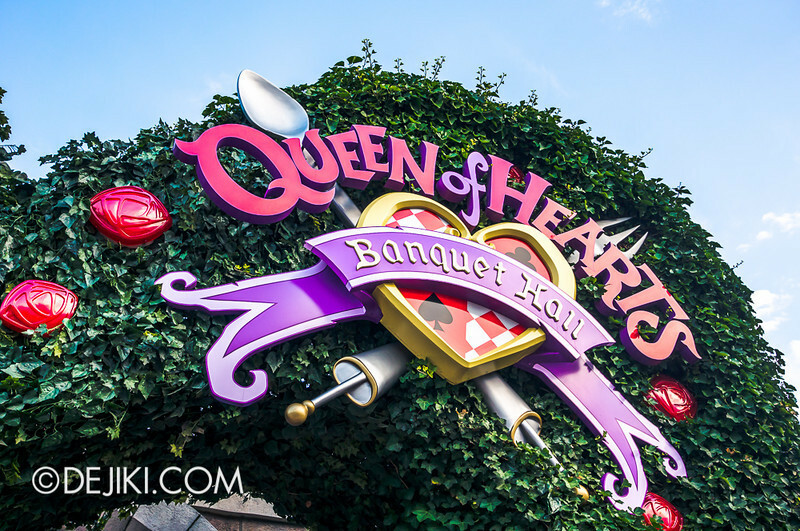 Since this Banquet Hall belongs to the Queen of Hearts, expect many things to come heart-shaped. 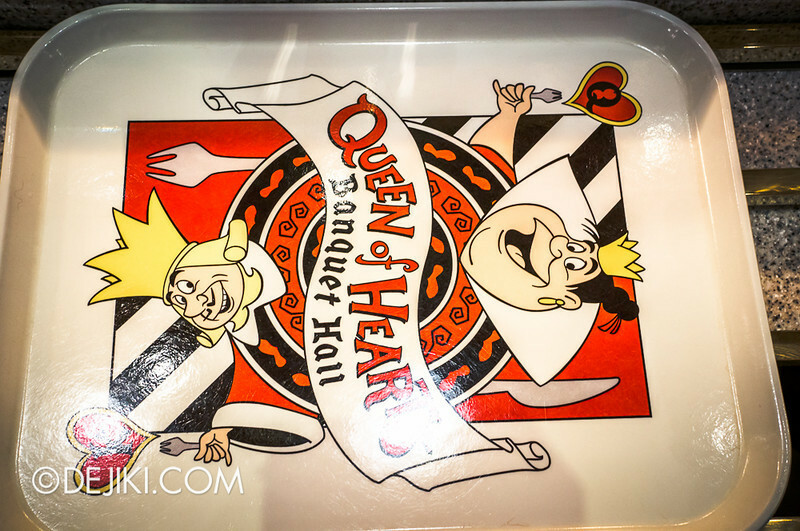 Seems like every restaurant in Tokyo Disneyland has unique trays. 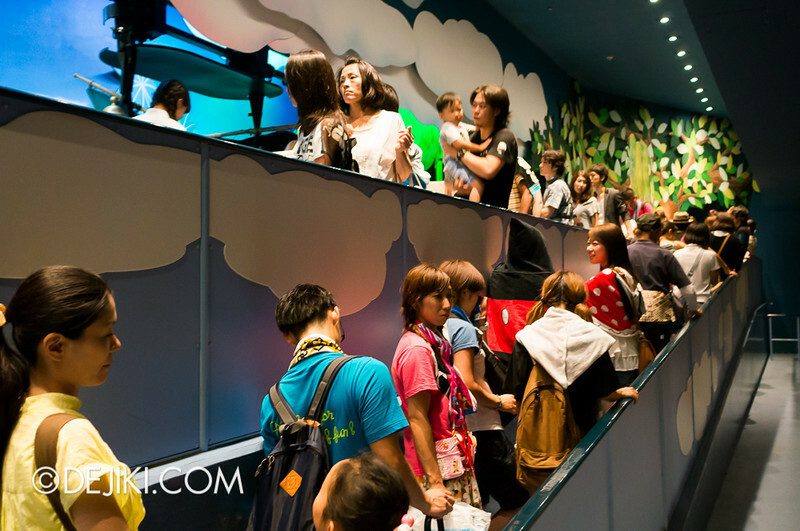 Some of them, especially the ones in Tokyo DisneySea, are really beautiful. Frankly speaking I’m surprised no one steals their trays the park does not sell souvenir placemats. 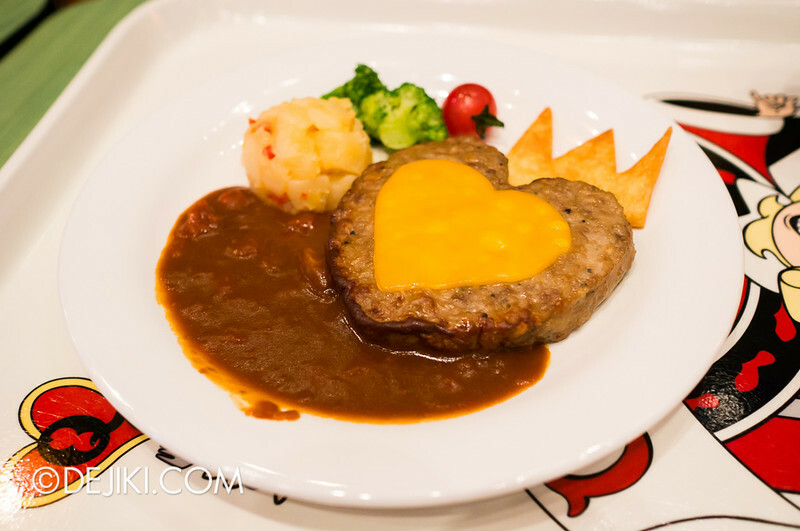 For ¥1280 (~S$15.60), you can have the famous Heart-Shaped Meat Patty (with seasonal sauces). During our Summer trip, it was served with Tomato-Brown Sauce. 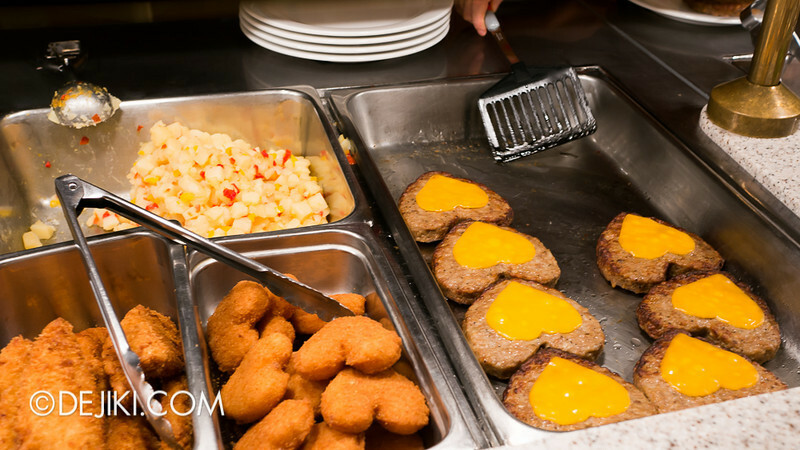 Apart from this, the restaurant also serves fried seafood, flank steak, grilled swordfish and rotisserie chicken. 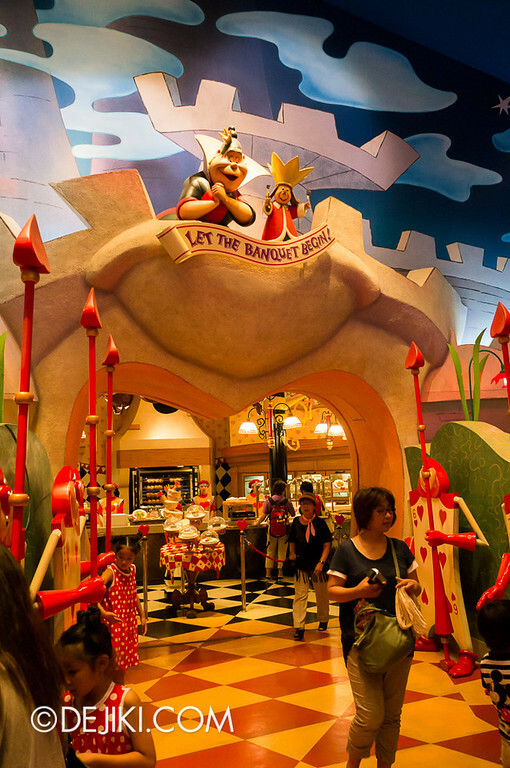 The most expensive main course is the Rotiserrie Chicken (¥1340, ~S$16.30) which is why this restaurant is very popular – the prices are reasonable for a theme park like Tokyo Disneyland. It’s hard to not let your eyes wander around the restaurant. The theming is definitely incredible. 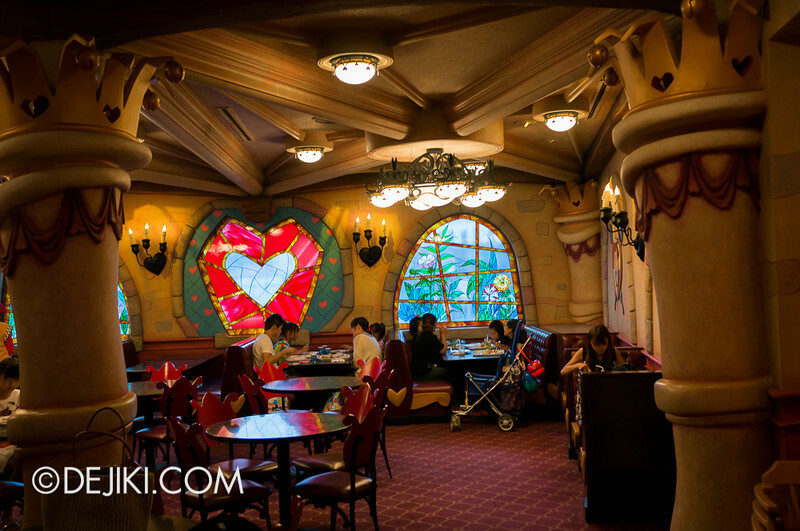 There is a beautiful wall of stained glass at one end of the restaurant (far background in this photo), which we forgot to walk up to see. But I jest. 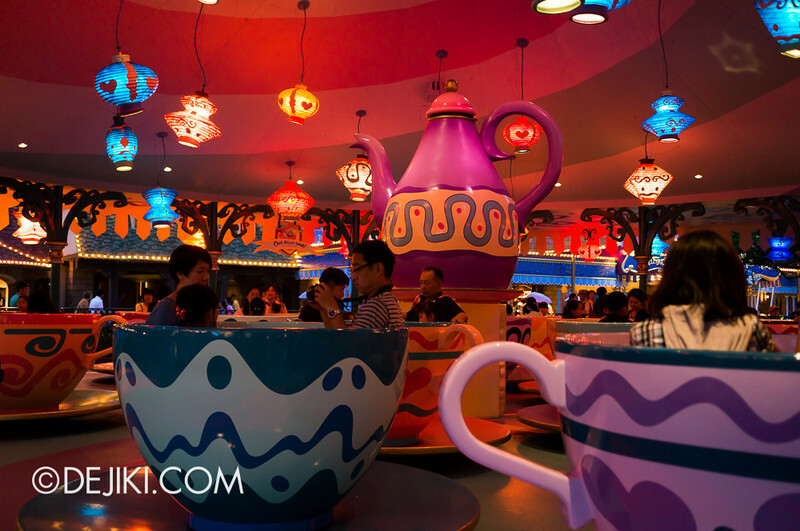 The wait times were too long for tea cups. Actually, right after dinner we went to Big Thunder Mountain. 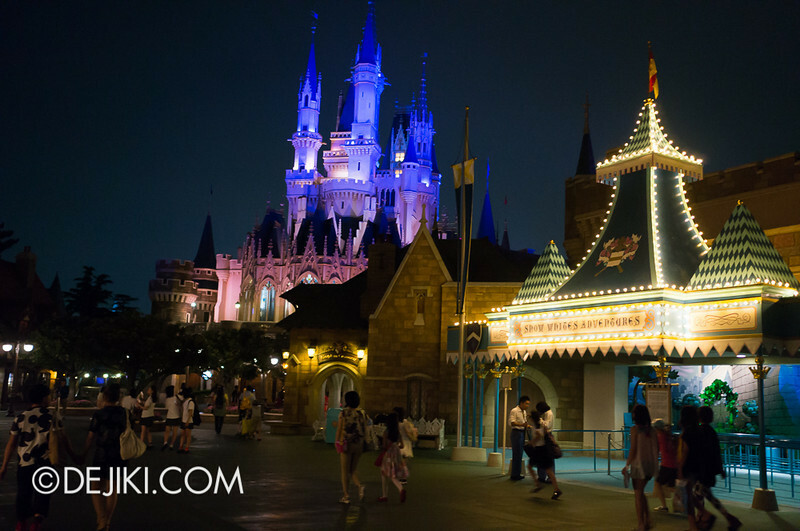 We returned to Fantasyland at night again. 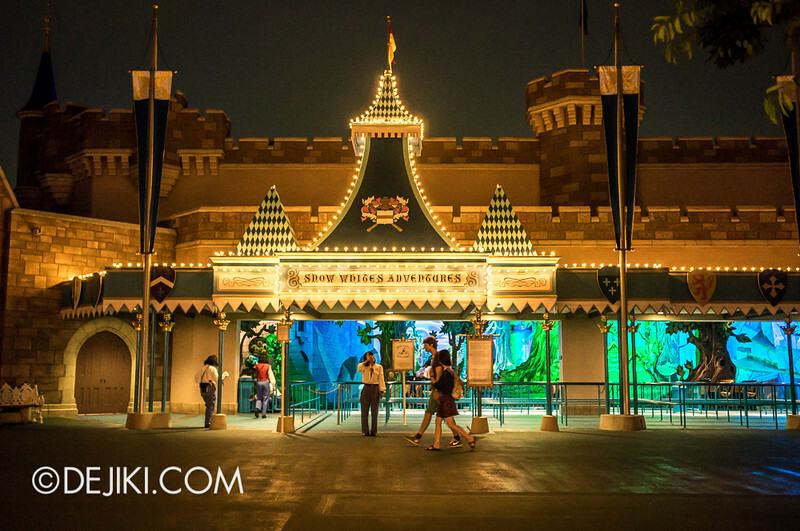 One side of Fantasyland glows eerily at night. 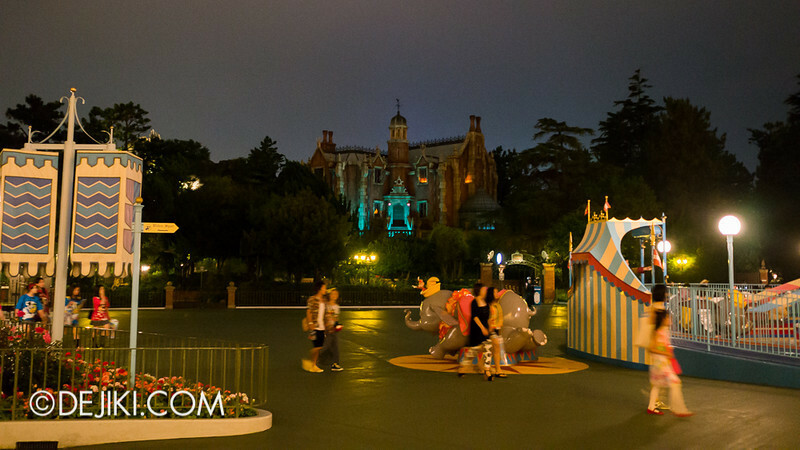 This was taken really late, in the park’s final half-hour of operations. 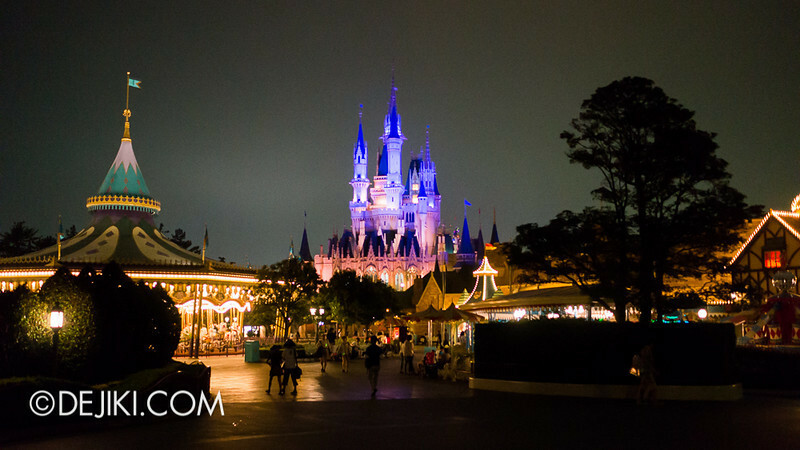 We went to Peter Pan’s Flight after a ghastly ride at the Haunted Mansion. 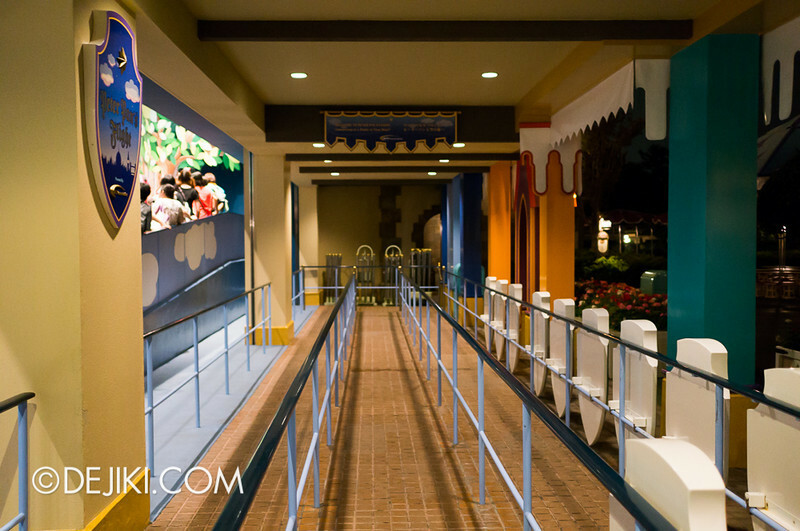 The queue is so simple, just like other rides from that “first era”. 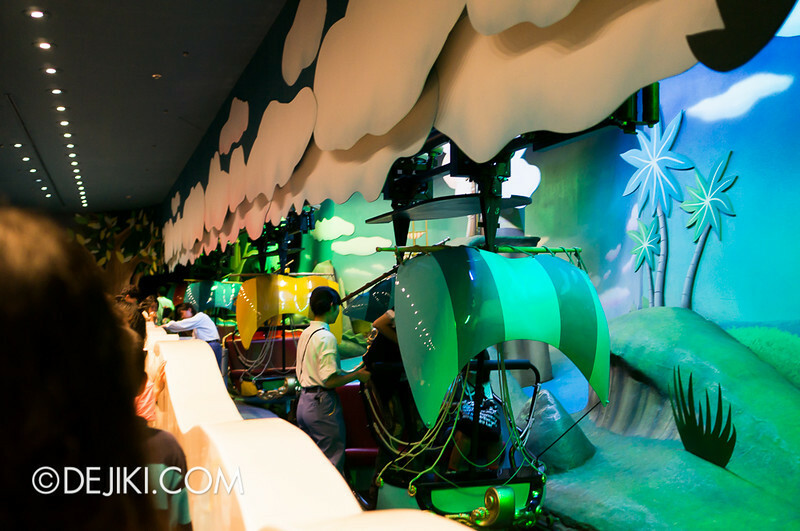 While some modern dark rides with suspended ride vehicles have updated technology and fancy effects, they don’t seem to use the medium of “flight” as well as this ride. 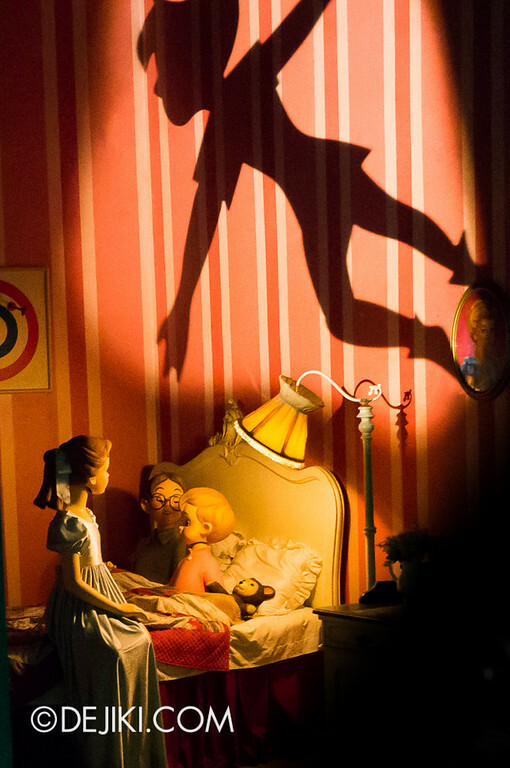 It’s quite magical, soaring through dioramas of London and Neverland. 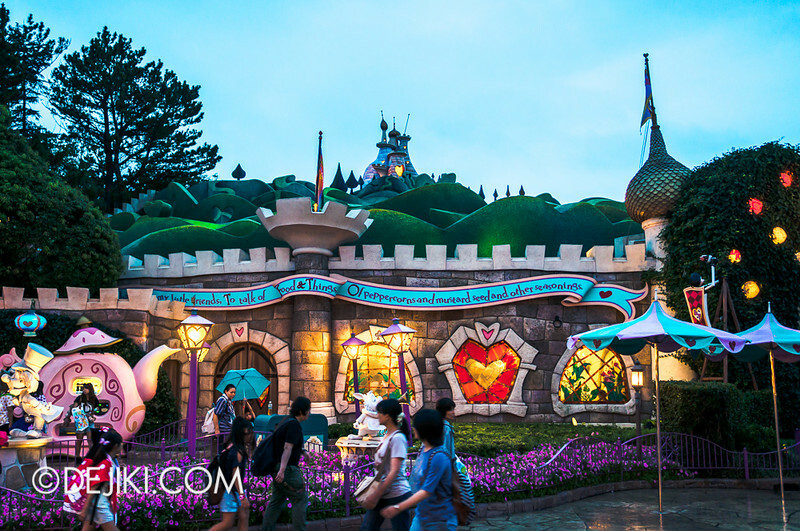 Snow White’s Adventures is another attraction that hasn’t changed over the years. 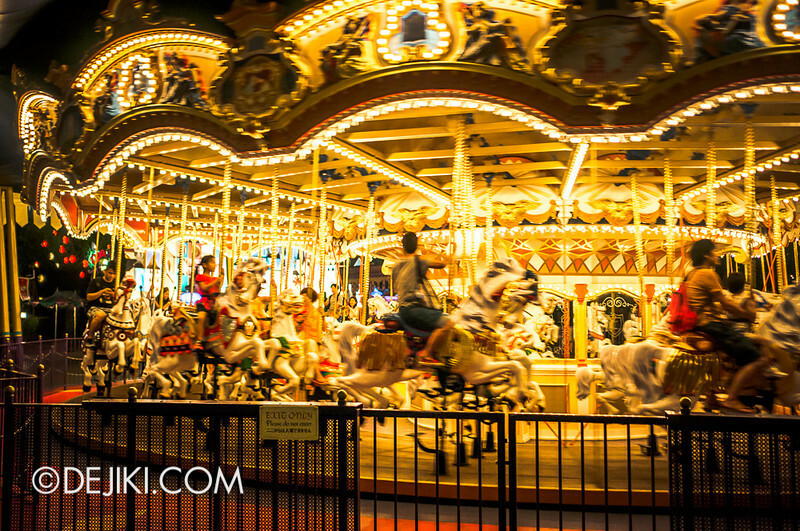 It might be frightening for young children (or even some adults), but you shouldn’t miss this ride – it’ a classic, and makes incredible use of simple, low-tech effects. 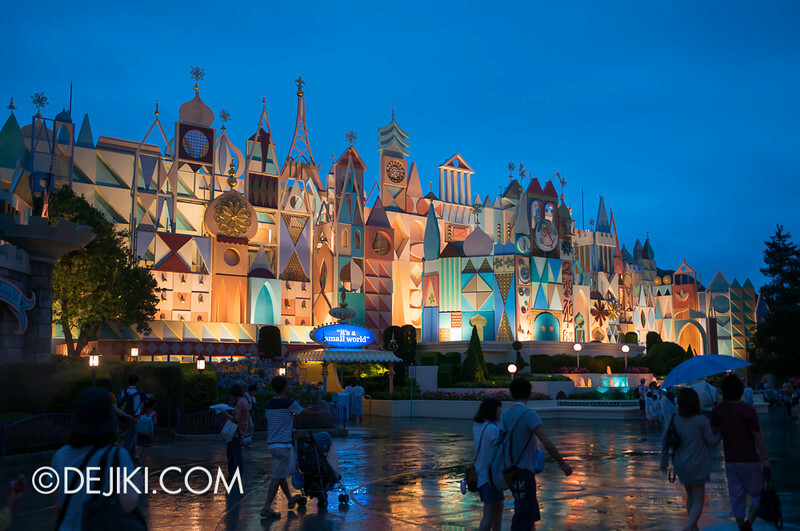 Due to its placement in Fantasyland, the ride’s facade has a basic “Fantasy Fairground” treatment. I always felt that the medieval village look (found at Disneyland and Disneyland Paris) suited the ride better. 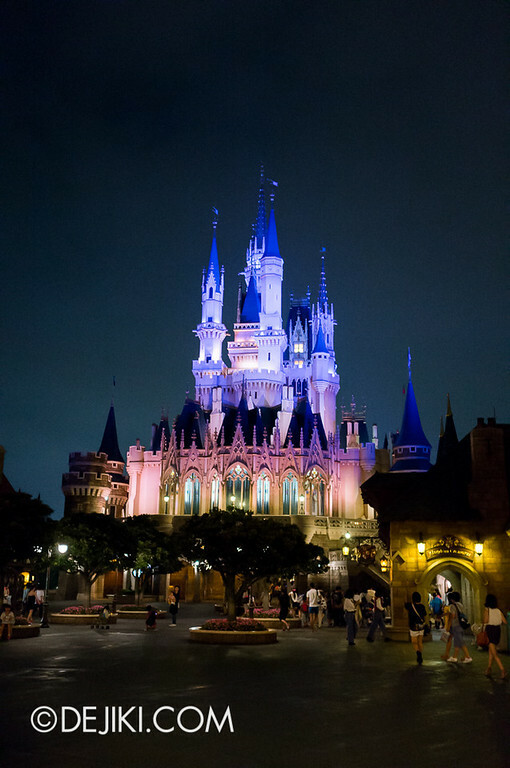 While Cinderalla Castle is much taller than Sleeping Beauty Castle (Disneyland and Hong Kong Disneyland), it’s still a scaled piece of architecture – smaller than what it’s supposed to be. The Castle’s forecourt is used for elaborate castle shows extensively throughout the year. The drawbridge is usually closed, blocked off with a black wall, if such shows are scheduled. During our visit, the wall was removed after the last night show of Soryo Kobu (爽涼鼓舞), the drum dance show during Disney’s Natsu Matsuri. We were then able to walk through the castle. 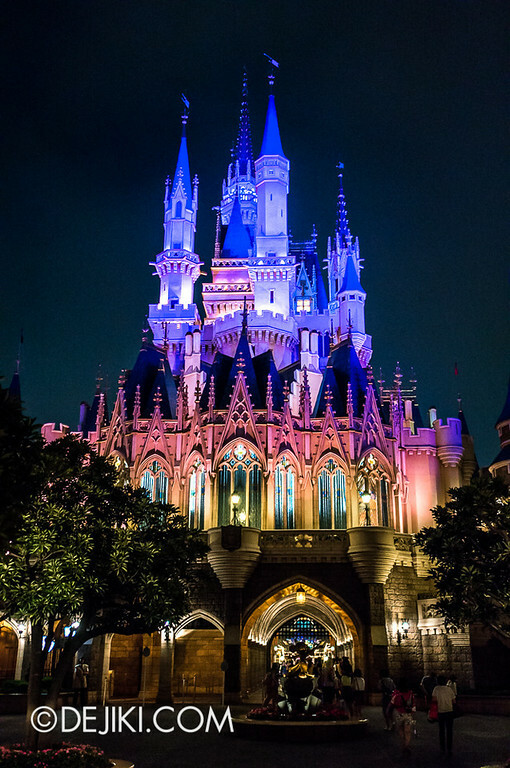 The second level of Cinderella Castle is an attraction – and one exclusive to Tokyo Disneyland. We will be heading there next.